Fast forward to 2018 and there are now a huge range of apps out there which work seamlessly with our mobile devices and mean making and playing music on the move is simpler than ever. Point Blank, an international music production and DJ School which was recently voted the world’s best, have scoured the market and narrowed down eight fantastic apps which they believe every DJ and Producer should possess, whether just starting out or a seasoned pro. No list of music creation apps would be complete without the original Digital Audio Workstation (DAW) from Apple. Given that there is currently no Logic App for iPhones or iPads, GarageBand is arguably the most popular, allowing users to easily and quickly create music in any which way they choose, in one, impressive platform. The app has the capacity to perform out a plethora of tasks, including multi-track recording, MIDI editing, the ability to incorporate your own voice using your device’s microphone, and a smart function which means user always play in key. Also known as Fruity Loops, the FL Studio app is another DAW; but this one is best for intermediate to advanced music producers and those who are looking for features beyond that which are found in GarageBand. The app is available on both IOS and Android and appears very similar to the desktop version of FL Studio, including many of the original features which fans of it have grown to love. Advanced components include a more technical FX panel, high-quality synthesisers and samples, drum programming and a step sequencer for quick and precise beat programming. The downside, however, is that this is not a cheap app and for such advanced features you’ll be required to fork out quite a bit extra. This app by Allihoopa lets users to create tunes with drums, bass and lead synth, making it relatively easy for beginners to learn the basics of electronic music on-the-go. With a simple to navigate interface (very similar to their music production software, Reason), the Figure app makes beat-making as straightforward as just tapping your screen and swiping your fingers along. Although there are better and more advanced apps out there for the seasoned pros, this one makes producing accessible to almost anyone. And better yet, it’s free to download! The Beatwave interface is based off of a grid and allows users to create beats and melodies in a quick and easy way, simply by moving their finger around and experimenting with their own unique sounds, whether they are new to this, or a total connoisseur. The interface is straightforward enough that first-time users can get to grips with it fairly easily without an introduction, though a tutorial is advised for its advanced features. Intermediate-level producers will enjoy the fact that they are able to layer multiple instruments together (up to four) and add extra effects to their compositions, allowing for multi-track recording. The “world’s best-selling DJ app” by Algoriddim basically transforms your smart device into a fully-integrated DJ system which works seamlessly with your personal iTunes library, as well as music streaming service, Spotify, so that you have easy access to all your favourite tracks. With a super-simple, basic set-up of two turntables, a crossfader and pitch control, users are able to create mixes on the move, or use the built-in Automix mode which allows the DJay app to create its own mix for you. It also has an inbuilt syncing feature and the capacity to record any of mixes you create. 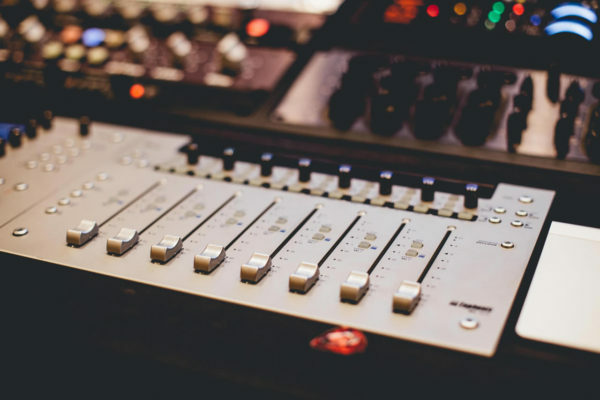 You cannot really run a list of the best music production apps without mentioning an offering by Native Instruments, the well-known creators of some of best hardware and software for DJs and producers on the market. Traktor DJ is the world’s first professional DJ mixing software for IOS, and will look and feel very familiar to those already acquainted with Traktor. In simple terms, this uncomplicated app allows budding DJs to control and mix sounds in mere seconds, using the songs stored on your device. Just give it a go and you’ll find yourself using it at home or in the club in no time! Another one from Native Instruments, this handy app allows users to create music anywhere. The app’s interface is based off the maschine’s drum pad, allowing producers to easily make music on the go. The Smart Play keyboard lets users to create basslines, chords and melodies which are always in key and sound just right, whilst they can also sample sounds stored in their library on iTunes, or using their device’s microphone. Moreover, The Arranger in the iMaschine 2 lets users build full tracks from their loops and scenes using just their finger. This is a brand app from the folks over at the record label, Ninja Tune, and the London-based studio, Seeper, but that doesn’t mean it’s not great. If you’re a fan of the label’s popular electronic artists, such as Bonobo, Lapalux, ODESZA and Amon Tobin, then you’ll enjoy being able to make cheap online purchases of their tunes and remixing them yourself with individual instrument stems. You can also produce your own music using the dynamic interface, wide range of effects and HQ sample-packs. Of course, an app or tool which one DJ or Producer loves, another might dislike. There is no right or wrong way to make and play the music you enjoy – it is simply about experimenting with several different tools in order to discover the interfaces you find easy to use, what features you require, and which have the ability to help you create the beats and tunes you love.